This is a sponsored post written by me on behalf of Credit Karma. The opinions and text are all my own. Credit Karma Tax lets you file right from the app, quickly and painlessly. You can take a picture of your W2 or upload it as a file so there's no need to fill in dozens of blanks, and it makes filing jointly easy (which I’m doing for the first time year)! 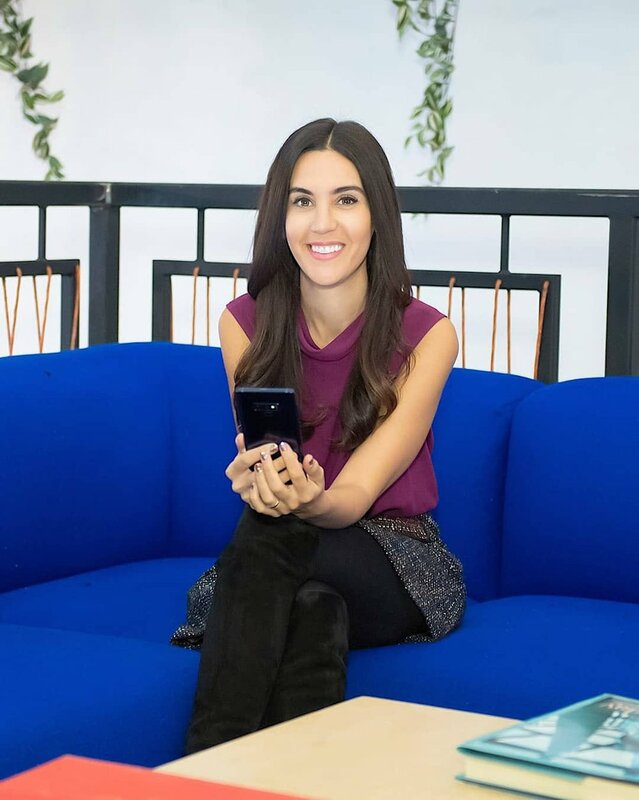 Head to my Instagram highlights to learn more about why I filed with Credit Karma this year (and shout out to WeWork for the great filming location)! This is a sponsored post written by me on behalf of MM.LaFleur. The opinions and text are all my own. Image accounts for over 30% of success in leadership, whether we like it or not. It was an honor to film this video with MM.LaFleur a couple weeks ago, spotlighting the incredible work Bottomless Closet does to help disadvantaged women enter/re-enter the workforce. If you recently Marie Kondo-ed your closet, learn how you can put those clothes to good use here! Recently at Mobile World Congress America in San Francisco, I asked executives to share the number one thing they wish their mobile device still had. Check out their answers here (T9 keyboard, anyone?). We also spoke with Carolina Milanesi of Creative Strategies, Inc. about how millennials are changing the workforce. Hear her answers in this video. And in the interest of looking back to look forward, learn what inspired me to start my own business, make my own rules and work from my own home (besides the fact I find most offices way too cold) in this feature for Fidelity Investments. Plus, with the holidays are around the corner, are you looking to tap into the wealth of the gig economy this season? I weighed in on some ways to land some extra work and diversify your income for U.S. News and World Report, including online tools like WorkMarket and Fiverr. Check out that article here. Shoutout to the inspirational Goldman Sachs 10K Small Businesses group for inviting me to talk about all things social and small biz last week. I wish I could start every day there. I was beyond grateful for the opportunity to teach the wonderful German students of Fresenius University of Applied Sciences this week! We talked about the power of social media, the evolving workforce and how I built my business. Shout-out to the students and to Berkeley College for hosting us. Isn’t it time to make our work, work for us? In 2011, I made the unorthodox decision to transition from a steady, salary job with benefits to a self-employed social media consultant. On-demand work is quickly becoming mainstream, and sites like WorkMarket are making it easier for contractors and companies to meet, fill job listings and coordinate payment. Head to Mashable - Business to learn more about my move from full-time to freelance, the three steps I took to get there and how my salary tripled in the first year. 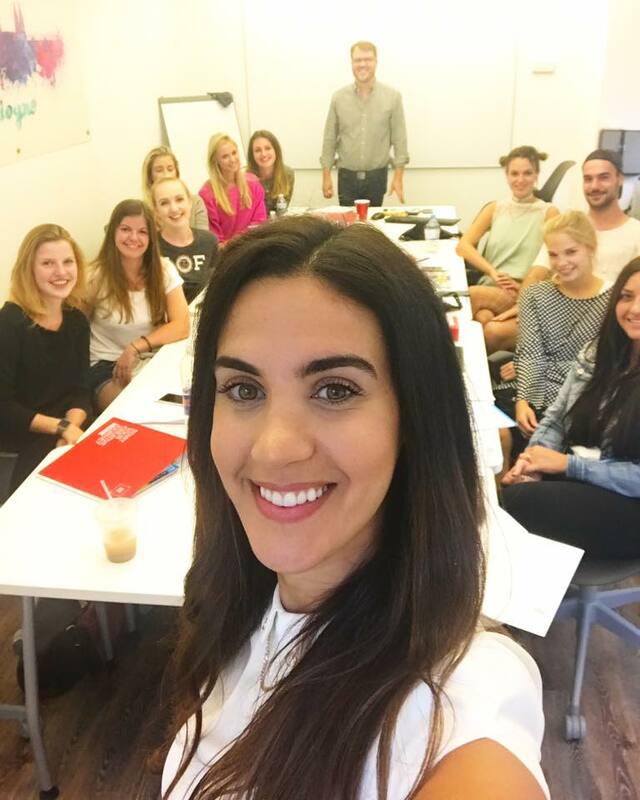 This week, I had the opportunity to guest teach an NYU class, sharing the story of how and why I built my business. From getting laid off from Rolling Stone in 2008 to starting my own company in 2010, I explained to the class how the setback turned into an opportunity to transition from print to digital. Shoutout to NYU for inviting me and to the passionate students who took the time to learn a little bit about the world of digital and social media. This week, I was invited by the Retail Orphan Initiative (RetailROI) to speak about social media trends to 300 or so retail executives at the Harvard Club of New York. From storytelling and video to social networks in the workplace, one of the top trends I addressed was the rise of the social media influencer. MuseFind found that 92% of consumers trust influencers more than traditional advertisements featuring celebrity endorsements (which explains why so many brands are gravitating toward hiring influencers for their commercials and campaigns). Thanks again to RetailROI for having me. This week, RIS News hosted their annual Rock & Retail Event, where retail industry pros come together (right now) to enjoy networking and great music at the Hard Rock Café in Times Square. I had the pleasure of performing for the fourth year in a row - this year bringing along my dear friend, Mashable's Tracey Edouard, on strings. Watch our cover of John Mellencamp's "Pink Houses" here. 2016 isn't the problem, and 2017 isn't the solution! Earlier this week, I had the pleasure of joining Mashable's Tracey Edouard for a Facebook Live about how to take stock of your accomplishments and prepare for success in 2017. I gave my top career tips - from regularly documenting accomplishments to learning new things every day to asking your employer the right questions at the right time. Some audience members too chimed in with great questions. Here are a few of my favorites. What tips do you have to best highlight social media achievements on social media platforms? Social media is a priority, not an option, and your online presence is as important as your offline presence. Share your accomplishments, but do so with humility. Give credit where credit is due, and show off your hard work. How can professionals get over their fears and take risks? This takes practice. Turn your fears into gratitude. Instead of fearing public speaking, be grateful so many people want to hear you speak and gain value from you. What are the most valuable lessons of this year? It's important to prioritize work-life balance. To work well, it's important to disconnect and take time to recharge and relax. Here are the top five things you need to know to become more successful in 2017. Articulate your goals. Know what you want, how you plan on getting there, and practice your pitch. Calendar your tasks. Don't just create to-do lists, but schedule the days and even times you want to get things accomplished. Master your domain. 84% of recruiters are using social media. Keep your channels up to date, and list your accomplishments with humility. Learn the art of influence. Expand your social networks. Connect with people online and offline, and be authentic in your engagement with people. Check out my previous #BizChats for my top networking tips. Consider your legacy. No amount of money is worth making you miserable at work everyday. Ask yourself: am I providing value? Do I love what I'm doing? To hear my final key for becoming more successful in 2017, check out the Facebook Live video. Thanks Mashable, for another great #BizChat! This week, I hosted one of Refinery 29's final Facebook Lives 2016 - speaking about social media best practices in 2016 (and some trends we need to leave behind). Before looking ahead to 2017, I talked about some of the biggest social media fails of 2016, from Ryan Lochte's untimely hair Tweet to Total Beauty's Whoopi Goldberg/Oprah mixup. The takeaway from these fails? Always do your research before posting on social media, hire thoughtfully, and if you do make a mistake, take a step back, assess the damage and apologize if necessary. Before talking about best social media practices for 2017, I opened up questions to the Refinery 29 audience. Here are some of the top questions and takeaways. Q: Do you have tips on doing social media for businesses? A: It can be difficult to create authenticity, as people tend to connect more easily with people than with brands. The most effective way for a business to create a successful social media presence is to fit into one (or more) of three categories: funny, beautiful, valuable. Give audiences something to come back to you for - time and time again. Q: Do you have tips for bloggers? A: Differentiate yourself. There are so many blogs on so many subjects, so it's essential to find a way to offer something unique to your audiences. Learn more about how to start a blog in my article for Refinery29. Q: Do you think a business needs to have all social media platforms? A: Put simply: No. Social media is a quality over quantity game. Choose one or two platforms that really apply to your brand where you can post quality, memorable content rather than posting subpar content on every channel. 1. Overexposure: You never want social media to be a one-sided conversation. Instead of over-sharing, try to engage with your audience, ask questions and inspire genuine conversation. 2. Spamming: Avoid overusing hashtags and "follow for follow" or "like for a like" spamming. Be authentic, or your audience will see through your efforts to gain a following. 3. Avoid Basic Content: Basic content (or posts that are uninspiring) should be avoided. Be creative and stand out. 1. Differentiate. Add value to the community you have formed. 2. Be proactive and reactive. Keep the social in social media. Engage with your audience. 3. Focus on quality over quantity. I can't emphasize this enough. Create beautiful content that lasts and makes an impact. Check out my full Facebook Live to hear more about best social media practices. We'll catch you next time! This week, I hosted a special advance screening of the film, which stars James Franco, Bryan Cranston, Megan Mullally and Zoey Deutch. The film features a comedy of errors, when Ned Fleming (Bryan Cranston) realizes his beloved daughter might marry an uninhibited (if not inappropriate and vulgar) Silicon Valley billionaire (James Franco). Thanks to everyone who came out to see the film! Catch Why Him? in theaters Friday. As a content creator, small business owner and American Express Cardmember since 2003, supporting my fellow small businesses is not only a pleasure - but a privilege, especially since AmEx helped me start my own business as one of my first-ever clients back in 2009. On this year's Small Business Saturday, I celebrated a few of my favorite small businesses - Viyet, for helping us style our shoot locations, GLAMSQUAD, for always getting me camera-ready and Splash, who I've worked with for three years to curate my events. Learn more about the beauty of shopping small here. In the last 60 seconds, 216,000 photos were posted to Instagram, 1.8 million likes were given on Facebook and 72 hours of video footage was uploaded to YouTube. From mobile and wearable devices to social media and blogging, the impact of our constantly-engaged digital landscape is forever changing how consumers engage with brands. This past Thursday I had the pleasure of joining [L]earned Media for a candid conversation about the new age of buyer behavior. Joining me on the panel were Evan Kraut, Managing Director of Grey Adventures, P.J. Pereira, Founder of Pereira & O'Dell, Brian Shimmerlik, Founder/CEO of Vengo Labs, Rupert Maconick and Executive Producer of Saville Productions. Thanks to [L]earned Media for inviting me to participate in a great conversation.